Think back to when you were 12 years old. Think about the excitement you would have felt seeing your name in the town's newspaper, knowing how proud your parents would be and how your neighbors would notice. Then think about what we're losing in the digital age. 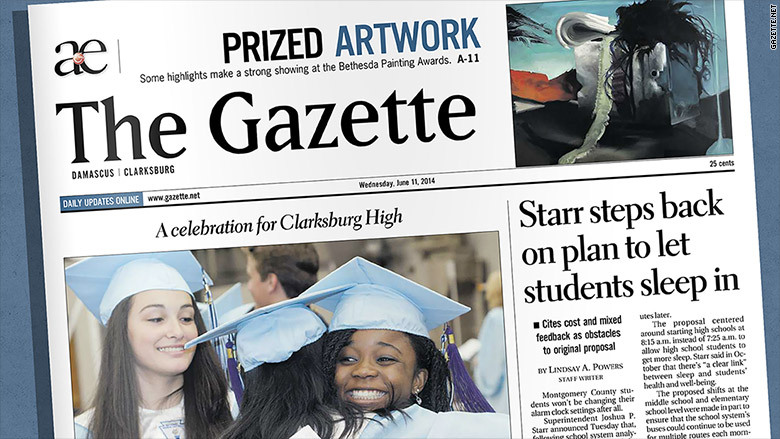 I'm thinking about it because my hometown newspaper, the Damascus Gazette, in Montgomery County, Md., was just axed by one of Jeff Bezos's companies. By writing for it, the Gazette helped make me into a real reporter; by reading it every week, the paper deepened my affection for the town where I grew up. I know this is not a new story. In fact, more and more of us have a version of this same story -- the feeling of losing a cherished local institution and a nagging sense that nothing can quite replace it. For me, it was the Damascus Gazette. The free weekly paper isn't what it used to be. Over time, it was gradually combined with other Gazettes in the county, shedding some hyperlocal news along the way. But the brand still has widespread recognition across suburban Maryland. Bezos picked it up, maybe without even knowing it, when he bought The Washington Post in 2013. The Post owns small papers all around the metropolitan area. The Post's Community Media division apparently tried to sell the Gazettes in Montgomery and Prince Georges counties, but was unsuccessful. Staffers at the beleaguered newspaper chain received layoff notices on Friday and found out that next week's paper will be the last. "We are all of out of a job. Such is the life of journalism," Gazette web editor Kent Zakour tweeted. It doesn't matter that the news was unsurprising. No news about local paper closures is surprising at this point, ten years into an industrywide downturn. The announcement still stung, both in media and political circles across Montgomery and Prince Georges counties, and among ordinary readers. I confirmed this by calling my mom. "Who's going to cover the truly local news here?" she asked me. The truly local news. Sure, the TV news trucks turn up once in a while when there's bad news in town. But my mom was referring to the kind of news we all used to expect from free papers. I was lucky that the Gazette said yes when I proposed writing a monthly column during my senior year in high school. Looking back now, it was one of my first times ever working with a professional editor. And after freshman year in college, the newspaper said yes again when I applied to be a summer intern. I wrote about high school graduations, toll lane proposals, church fundraisers and local performances. My verbosity was evident early on because I turned in 650 words about the opening of my town's first Subway sandwich shop. "FAST FOOD FRENZY," the front-page headline declared. I still have a copy of the six-page Reporter's Guide I was given the day I started interning. "Make sure all names are spelled correctly and capitalized," it reminded me. What I don't have are any stories to tell about tough-as-nails editors or outrageous reporter antics that summer; the newsroom was a pretty sleepy place. But I came to understand beat reporting 101. The Gazette's sole full-time Damascus reporter, Susan Singer-Bart, knew the town like no one else. It didn't matter that the newspaper only reached 5,000 readers, a fraction of the size of even my college paper. What mattered was that they were the right 5,000 -- the business owners, the teachers, the pastors and the other townsfolk who made Damascus a place, not just a pit stop on the way to Mount Airy or Gaithersburg. And after I grew up and moved to New York City, Singer-Bart kept Damascus readers apprised about my career. "Damascus grad," the stories always said. Singer-Bart left the paper years ago. The Gazettes all around the area have been gutted by layoffs, layoffs that matter enormously to local communities. The folding of the papers is obviously the most consequential move of all. Pretty much ever since I stopped interning at the Gazette, my beat has been the media industry. I like to think I'm level-headed about the upheaval in print and optimistic about the digital future. But on a day like today I can't help but think about what digital can't do as well as print. When I was 12, according to the Gazette's web archives, I received a middle school honor roll certificate. (So did half of the rest of the class, apparently.) A few months later I won an award at the Damascus Community Fair. I'd forgotten, of course. The Gazette hadn't -- but soon it'll be gone.